Rungis Market is located just outside of Paris, France. 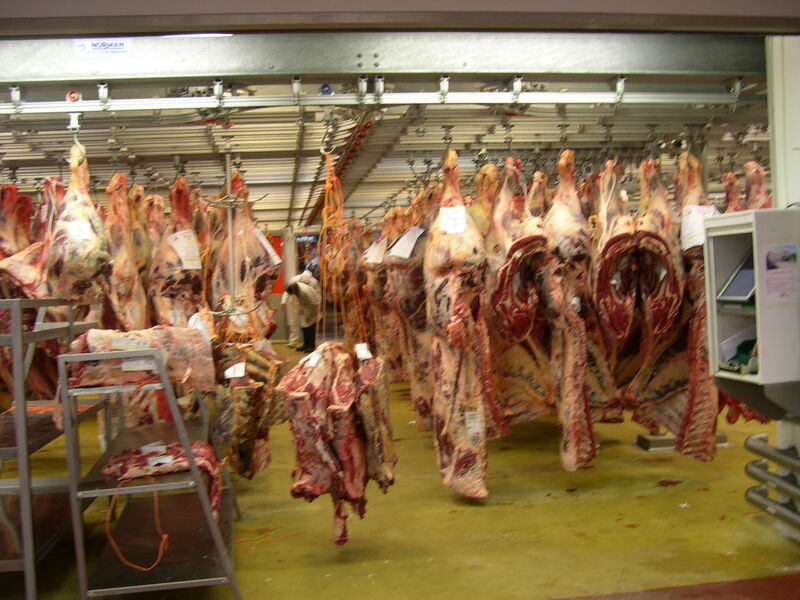 It is the largest wholesale food market in Europe. The Tokyo Fish market and Rungis rival by claiming each is the largest in the world. The Rungis Market has huge areas dedicated to fish, meat, cheese, produce and flowers. The place is a city all its own and that city is mostly alive at the very wee hours of the morning. In fact the fish house closes between 5 and 6 AM. Other houses soon follow. We joined up with a culinary school from Scotland to make the minimum 20 for our all around tour. Phillipe was our guide for 2 years in a row and quite a good guide too. He told us stories of how the fish they are seeing now aren’t as large as fish they got in the past due to over fishing of certain species such as Tuna and Salmon.He told us of growing fields in northern Africa where acres of produce is grown and shipped in to the market. This market was once located in the Les Halles area of Paris. The army came in and moved the entire market overnight to the new Rungis location. The entire re-location was hush-hush and only revealed after the move was complete. 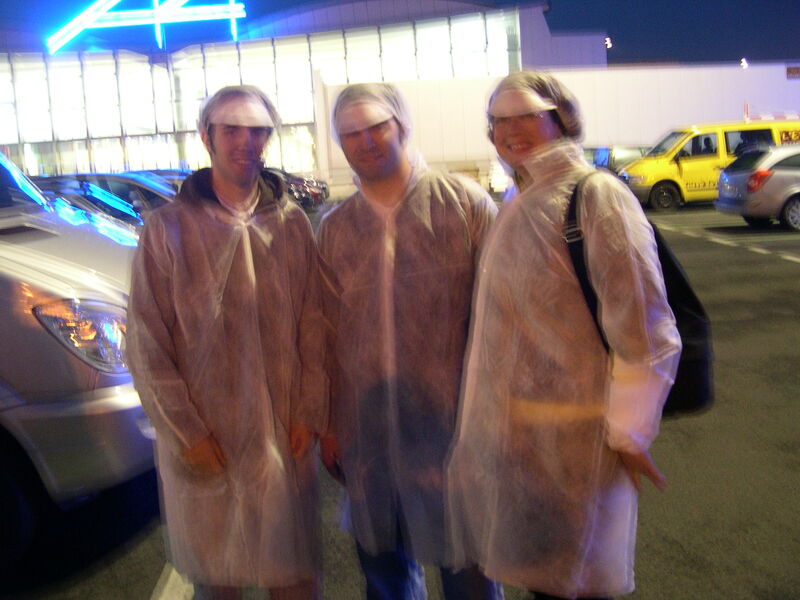 We were outfitted in silly thin paper coats for sanitation, ice and water all over the floors (slippery) and fish everywhere being hustled about on flat beds, forklifts and all in a rush to finish their business by 6AM. You had to watch and listen for the ‘beep-beeps’ as the fish were hustled where ever they were rushing them to. The meat house was akin to being in a nightmare. 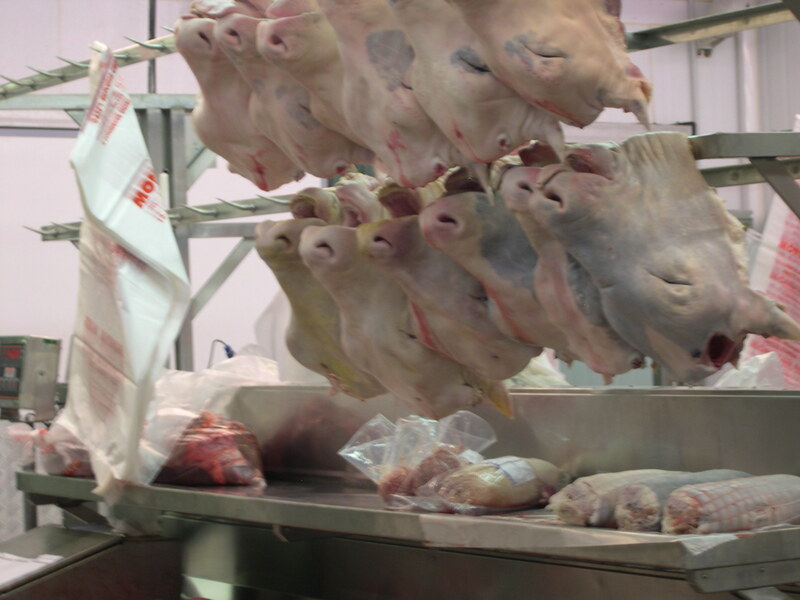 Meat carcasses hung everywhere – pigs, cows, goats, lamb, and even horse. Although the horse was not in when we were there they do, on occasion, carry it. One pork house had pig heads in a pile. One guys job was to yank the tongues out and toss the tongueless head into a big wheeled basket full of other tongueless heads. One fell out as it was tossed, the next worker came by and it out of the way of the wheels and moved the entire grotesque basket to another room behind big blood smeared doors. I know these are cow heads, not pigs. The pigs were in a pile getting their tongues ripped out, these got the distinction of being hung on steel pegs for some reason. Later that evening on a menu, when seeing “Tête de cochon”, I thought to myself, yeah, saw that kicked too. Next? 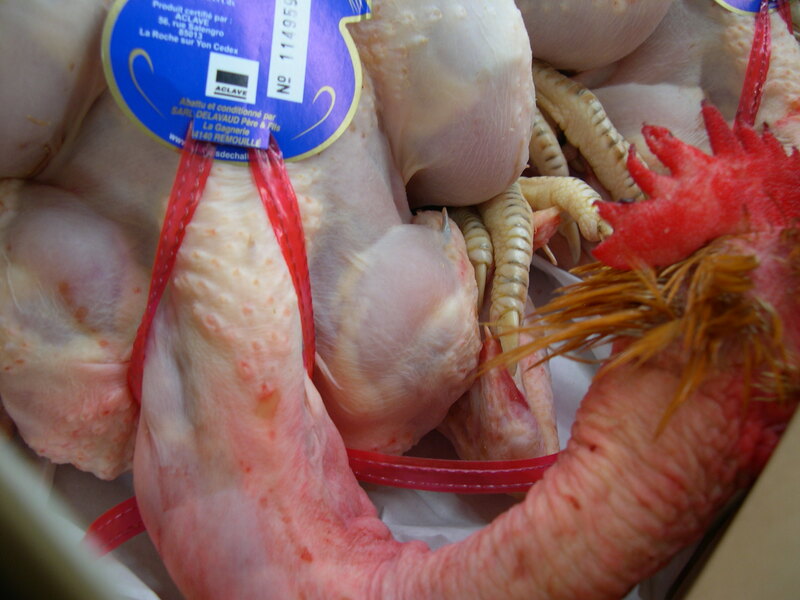 They sell birds with the feet and heads on so the type of bird can be identified. The produce markets are displayed like incredible masterpieces of produce arrangement. Such beautiful fruits and vegetables! The cheese house features cheeses aging in all stages. 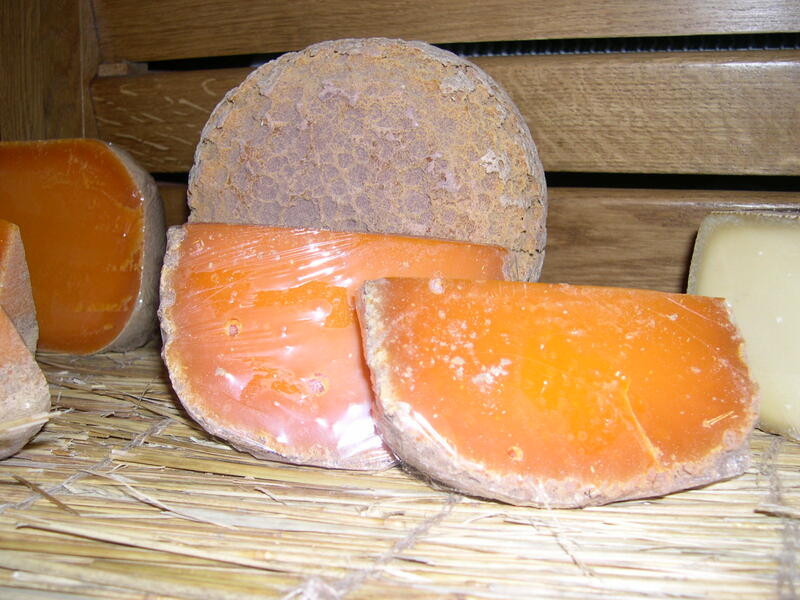 There are several cheese Americans would consider spoiled by the amount of mold forming on the outside rind. There is even one cheese you need to knock the bugs out of before you cut it. It looks like a cantaloupe inside and out. The cheese is very tasty. I wish I could remember the name of it. My favorite cheese is a goat cheese called “Pouligny St. Pierre”, so yummy. The flower market is spectacular. I wished I could buy a bunch for my hotel room but, they only sell them by the truck load it seems. This market is a must visit for food tourists. The only thing is you need to have a group of 20 to qualify for a tour. If you go, ask for Phillipe if he is still there. He is a great guide and speaks wonderful English, and French and probably several other languages as well. We had the best croissants, hot chocolate and cafe au lait at this market. Phillipe arranged for us to stop in one of the restaurants that serve the vendors after our tour. He had to make a special request because the restaurant was typically closing for the day when we finished with our tour. The restaurant is located next to the fish house. There were coffee stands and a bar inside the meat house. 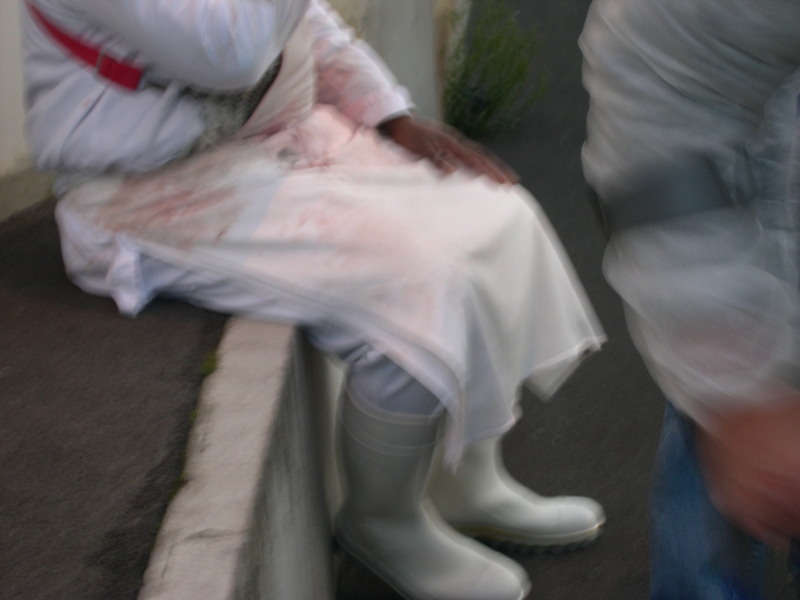 It was odd to see all the meat workers in their chain mail guards over clothes with scimitars strapped in steel sheaths. I have to apologize for the quality of the photos here, I was trying to be discrete about taking photos. I must say that considering the job these men do, their all white clothing was actually not too bad. To to end this lovely visit, the produce and flower pavilions. 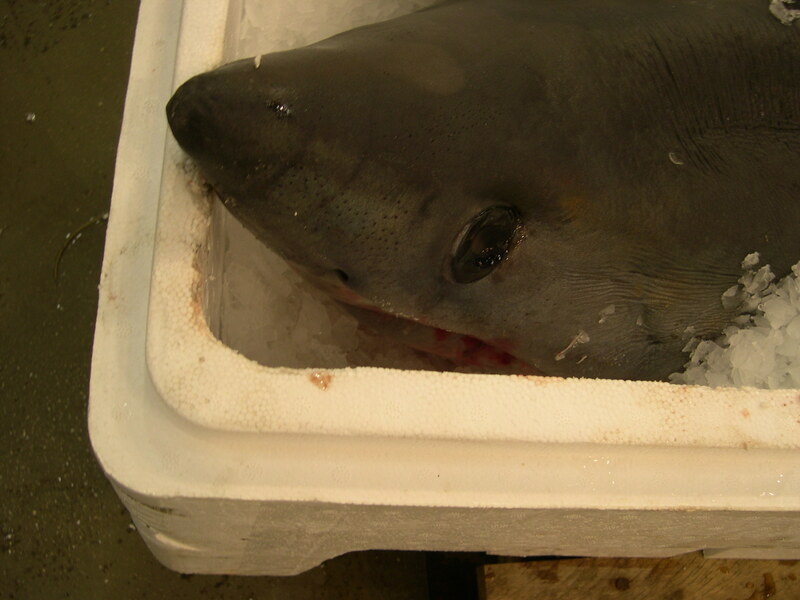 This entry was posted in Teaching Culinary School, The Life of a Chef and tagged Fish, food, France, Paris, Rungis, travel, wholesale food market. Bookmark the permalink.